Back in 2012, the Android Market was rebranded to the Google Play Store, and in the process it brought the stores for books, music, and movies under one roof – TV shows and magazines (later renamed Newsstand) were added later. Now a new product category is about to go up for sale: Audiobooks. Actually, audiobooks probably won't be treated as a different category, rather another buying option to exist side-by-side with ebooks. If you're looking at an ebook that has an audiobook counterpart, a label will point out that the other format is available with a button to switch to that option, and vice versa. Most audiobooks will obviously have a price tag on them, but there will be some freebies, as well. There aren't very many strings here, nor are there any dedicated layouts related to audiobooks, which suggests they're probably not going to launch with this version of the Play Store. Even if you could begin buying audiobooks tomorrow, there's not really a good app for playing them. Play Music supports podcasts, which are at least similar, but that experience is still missing quite a bit and it's nowhere close to suitable for audiobooks. Perhaps we'll see this responsibility go to Play Books, or maybe a new app is on the horizon. No, we're not talking about system notifications this time. This topic is going to focus on a new place for notifications right inside the Play Store. Google is going to begin providing "important notifications" about your favorite apps and games. A new button will appear in the action bar with a counter for the number of unread notifications. Judging by what can be seen here, it reminds me a bit of the old Google+ notification screen. Beyond the single line referencing that this screen will contain notifications about apps and games, there's nothing to suggest what will actually go into this spot. It's possible that changelogs will be posted here when a developer actually changes the What's New section for their app – at least some of them do – or maybe Google will expose this as a place where developers can post messages for users without building push notifications directly into their apps. Notifications could be great for many things like inviting users to join a beta test channel, pointing out that an app is having a major release, or notifying users of a serious issue. On the other hand, it might be inviting abuse and cross-promotion by devs with little sense of discretion, so we'll have to see how it shakes out. There's a great divide between users that leave on automatic updates and those that promptly turn it off after setting up a new phone. If you happen to be one of those that turns off this option, you might be interested to know that Google will be offering a new option that limits automatic updates to just system apps, leaving all of your third-party apps to be manually updated as you see fit. This option is probably for jerks like me that let the Google app go for weeks on a phone without updating to the latest version. Of course, I have a reason, but most people should probably want to be fairly current on critical apps. I'd still prefer to see more convenient options to pick individual apps to auto-update, but this might be a good middle ground for the micromanagers among us. Downloading large apps over a cellular connection is a pretty easy way to burn through your data allotment each month. To give users a convenient workaround, the Play Store began offering to wait until it was connected to Wi-Fi before beginning large downloads. At just over a year old, it looks like that feature may be going away. 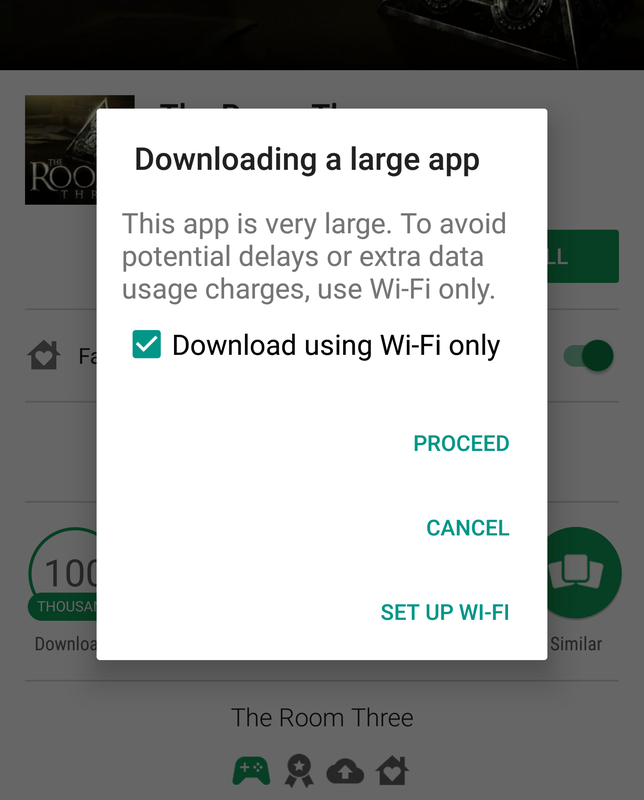 New text clearly explains that the Play Store will no longer support the ability to wait for Wi-Fi availability. Instead, app installs and updates will occur immediately over whatever network type you're connected to. No explanation is given for why Google is pulling this feature, and it seems like an about-face after it was promoted last year for use in data-strained regions like India. My top two guesses are that either most users were turning it off or that it was causing confusion – and by that I mean people probably misunderstood how it worked and expected different behavior. We'll end this teardown on one last really quick topic. There's a new layout for a 'deal of the day'-style promotion. This obviously requires no more explanation, so we'll cut it off right here.